You’ve heard it, you’ve seen it, and if your lucky (or not, depending on your tastebuds) you’ve tasted some! Although…what is this weird liqueur? What is it made of, and how is it made? Where is it from? This brightly colored yellow liqueur is relatively simple. Lemons – as you may have guessed from the name, or even from the notable color – are the main ingredient! Add in some sugar, and some water and pure alcohol, roughly 80 days, and you can easily make yourself some Limoncello! If you were to purchase a bottle of Limoncello, make sure you understand that there is a difference between the industrial, mass produced drinks and the artisanal, locally made liqueur. Mainly, it is the lemons themselves! The origin of limoncello is often disputed, as some will claim that it’s from the Amalfi Coast, particularly Sorrento, or even the island Capri. In 1988, the first registered trademark of “Limoncello” was created by Massimo Canale and since then the liqueur has managed to cross many borders and become an easily recognized name. Depending on where you go in Italy, the name for this brightly colored yellow drink can vary from “limoncello” to “limoncino,” but it is practically the same thing. While the place of origin is disputed, it’s known to have been around for at least one hundred years. Even though Limoncello liqueur is served in a small glass, almost like a shot, you do not drink it like one! Limoncello is meant to be sipped and tasted, either before or after a meal, but most drink it after. When the liqueur is served cold, it can act as a fabulous digestive, but people even drink it at room temperature. Afraid that when you go to drink it you’ll be hit with a sour taste? 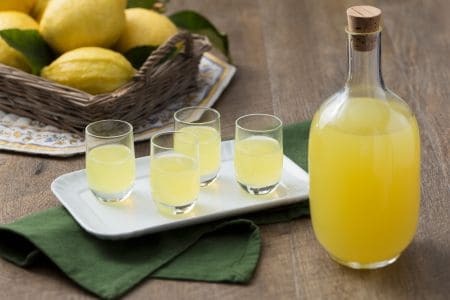 It’s a valid fear, and can often push people away from trying the drink, but when made correctly, limoncello is supposed to give the traditional lemon taste without the sourness or bitterness of actual lemon juice! Apparently, limoncello also comes in a variety of flavors. There is pistachiocello (pistachio), meloncello (cantaloupe) , arancello (orange), and fragoncello (strawberry). There’s even something called crema di limoncello where instead of the syrup made with water and sugar, milk is used. The crema di limoncello variety usually has less alcohol content as well, probably around 17%, while typical limoncello is around 28-32% alcohol. A great way to store limoncello is actually in your freezer! Since it has such a high alcohol content, it’s not likely to freeze while in there, so this is a great way to keep the liqueur chilled for when you’re ready to drink it. Now that you know the history of the drink, I hope you have a greater appreciation for the wonderful Italian lifestyle – always surrounding their great food and drinks!